This is a unique and interesting game, which can be played in many different ways. Once I was having a pool party with my friends and we ran out of ideas. So one of us suggested playing Ping Pong (also known as Table Tennis in some parts). The idea was fine, but we got bored after a little while and there was not much variation to the game. So someone proposed combining it with a game of Beer pong. The thought was exciting and we started playing. The name of the game is self explanatory, nowadays we play this game very often. All you need is a pool pong raft, which is easily available in the market along with a Ping Pong ball, some paper cups and some enthusiastic mates. 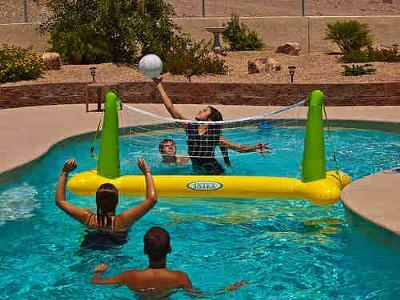 If you don't have a pool pong raft, you can also use your imagination to build yourself one (e.g. with a clothesline). 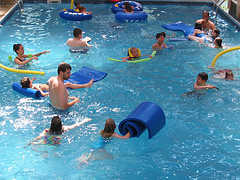 Since the game is played in a pool, it is important that the raft is floating. Make sure the cups stick in the table and the beer does not pour out of it. If you don't want to drink beer, you can replace it with any other drink.The idea of the game is to place some cups in a pyramidal shape. Although the cups form a pyramid they don't necessarily stay that way. As there are more wholes in the raft to target, it gets more difficult to make shots. This game is best played between two teams; each team gets two re-racks per game at any time. The standard rule is to take one with six cups remaining and with two or three cups remaining.The drill of the game is to toss a pong ball to the opposite side of the raft. 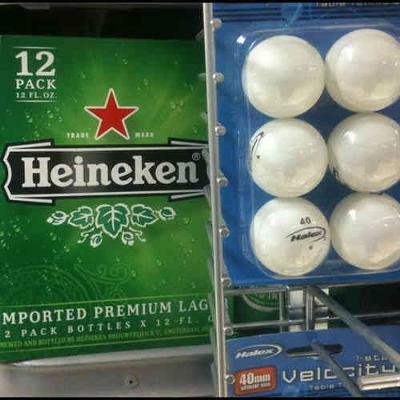 If the ball lands in any of the cups, the team who owns it will take the cup and chug the beer. The team that runs out of cups first will lose the game. You can also make custom changes in the game format: Once we had two rivals playing this game, and they bet for money and replaced the beer with pool water as a punishment. In my opinion chugging a glass of beer is more like a reward rather than a punishment! Do read between the lines and use your imaginations to make this game more interesting. I love to play teamwork games in the pool. I like games such as volleyball, or water polo. I think water polo needs to be pretty casual, and played with pool noodles, not crazy professional water polo. I also just like to hang out and have fun. I really like making a whirlpool in the pool. You get a bunch of people together and all walk in the same direction. Then, you walk faster, and then you run around. The water all starts moving like a whirlpool and will carry you around. It only works in a round pool, though. 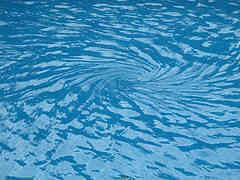 Oval or funny shaped pools don't make as good of a whirlpool. You have to work harder to keep the circle going in an oval shaped pool. You also have to do this in a private pool, and everyone has to be working together. But it's so much fun because you get carried around really fast! This is great for all ages... you all work together. You might need to keep track of little kids because the water can get going pretty fast, but they enjoy getting carried around by the water. I also used to play sharks and minnows. This game requires a lot of kids who are all of the same swimming level, and who are pretty strong swimmers. It's a variation on tag. One player is the shark. The minnows are trying to make it from one side of the pool to the other, and the shark is trying to catch them. 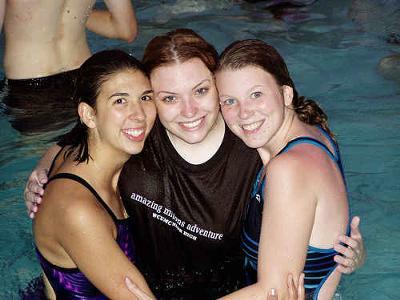 When they're on either side of the pool, they are safe. The shark calls out to them when it's time to cross the pool, and they all go at once. If you're caught by the shark, you become a shark during the next round. The game ends when everyone is a shark. The last person to get caught is the first shark in the next game. This game is fun because it isn't just one person trying to tag someone else. You're always on a team, working together. When I was a kid we used to play a form of water polo pool volleyball. You can play the game at any private pool party. We used to take inflatable loungers and pretend they were ponies. We would then take badminton net and have our parents tie it down in place, going down the pool horizontally. We would then blow up a beach ball or use one those cheap, already inflated balls from that huge toy bin from the store and pretend it was volleyball. We would then use the same scoring rules as volleyball and proceeded to play accordingly. 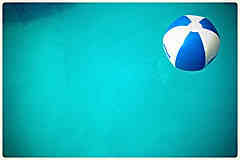 However we would not be allowed to swim across the pool for the ball. We had to stay seated on the inflated rafts while trying to hit the ball onto the opposing side of the net. So we looked like a bunch of ducks trying to waddle through the water on our rafts. It made the game more difficult, but a lot of fun! It provided hours of fun and a lot of exercise too. One game I love is called "Sharks and Minnows line Tag" It is a mix of two other great pool games, Sharks and Minnows and Line Tag. In Sharks and Minnows there are two groups, the sharks group starts with one person, and all other players are minnows. all the other minnows attempt to reach the other side of the pool without getting tag or "eaten" by a shark. If tagged, a minnow becomes a shark and then joins the shark side of the pool. 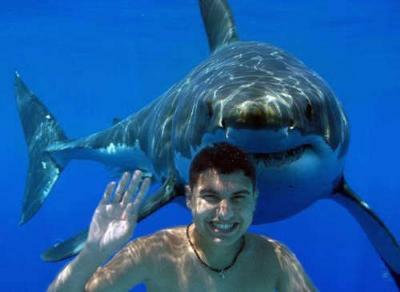 The bottom of the pool is base and minnows are safe there, unless pulled off by a shark. The last minnow alive wins. (Best played in a deep pool) Line tag is a similar game, only usually played with fewer people. In this version there is always only one person that is "It". 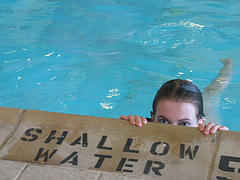 Lines (usually lane lines) on the bottom of the pool are a safe zone. This game is played perpendicular to the direction of the swimming lanes. If tagged, you are "It". Now, Sharks and Minnows Line Tag combines both of these games.